The first part of an ETL process involves extracting the data from the source systems. In many cases this is the most challenging aspect of ETL, since extracting data correctly sets the stage for how subsequent processes go further. Most data warehousing projects consolidate data from different source systems. Each separate system may also use a different data organization and/or format. Common data source formats are relational databases and flat files, but may include non-relational database structures such as Information Management System (IMS) or other data structures such as Virtual Storage Access Method (VSAM) or Indexed Sequential Access Method (ISAM), or even fetching from outside sources such as through web spidering or screen-scraping. The streaming of the extracted data source and load on-the-fly to the destination database is another way of performing ETL when no intermediate data storage is required. In general, the goal of the extraction phase is to convert the data into a single format appropriate for transformation processing. Selecting only certain columns to load (or selecting null columns not to load). For example, if the source data has three columns (also called attributes), roll_no, age, and salary, then the selection may take only roll_no and salary. Similarly, the selection mechanism may ignore all those records where salary is not present (salary = null). 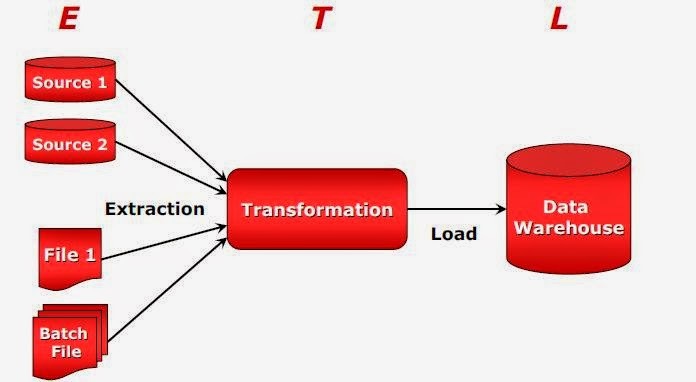 The load phase loads the data into the end target, usually the data warehouse (DW). Depending on the requirements of the organization, this process varies widely. Some data warehouses may overwrite existing information with cumulative information; frequently, updating extracted data is done on a daily, weekly, or monthly basis. Other data warehouses (or even other parts of the same data warehouse) may add new data in a historical form at regular intervals—for example, hourly. To understand this, consider a data warehouse that is required to maintain sales records of the last year. This data warehouse overwrites any data older than a year with newer data. However, the entry of data for any one year window is made in a historical manner. The timing and scope to replace or append are strategic design choices dependent on the time available and the business needs. More complex systems can maintain a history and audit trail of all changes to the data loaded in the data warehouse. The range of data values or data quality in an operational system may exceed the expectations of designers at the time validation and transformation rules are specified. Data profiling of a source during data analysis can identify the data conditions that must be managed by transform rules specifications. This leads to an amendment of validation rules explicitly and implicitly implemented in the ETL process. Design analysts should establish the scalability of an ETL system across the lifetime of its usage. This includes understanding the volumes of data that must be processed within service level agreements. The time available to extract from source systems may change, which may mean the same amount of data may have to be processed in less time. Some ETL systems have to scale to process terabytes of data to update data warehouses with tens of terabytes of data. Increasing volumes of data may require designs that can scale from daily batch to multiple-day micro batch to integration with message queues or real-time change-data capture for continuous transformation and update.